This week has been filled with some of my favorite foods! On Monday night, Paul and I went to a guided meditation class at Crosstown Arts (where I work), and then we went home and had PIZZA NIGHT! First of all, I should say that it's a miracle that I convinced Paul to go to a meditation class, but he did. And though he struggled to sit still and be quiet for an hour, he did it. And I'm very proud! So a pizza celebration was called for. I cooked a Daiya Meatless Meat Lovers Pizza (my new fave frozen pizza), and Paul grabbed a non-vegan pie from Domino's. We watched You on Netflix and ate pizza (plus salad for me). On Tuesday night, we had our monthly Vegan Drinks meet-up at Blue Nile, and I got the Veggie Platter with bonus tofu tibs (the tibs are a $3 up-charge but so worth it). Ethiopian is my FAVORITE cuisine. I'm practicing stopping eating when I'm full (it's hard), but I managed to save half of this for leftovers tonight. And tonight, I was so glad I did! This had red lentils, yellow split peas, fried tofu tibs, sauteed broccoli & green beans, collards & cabbage, stewed potatoes & carrots, green salad, beet salad, and all-you-can eat injera bread. This weekend, Paul ordered the Tofu Veggie Noodle Soup from Crazy Noodle and ended up only eating a small portion. So he left me the leftovers. I boosted them up with extra tofu and mushrooms and had that for dinner last night after our Crosstown Run Crew meet-up. Enjoyed while watching TV (and watching Maynard enjoy a treat). 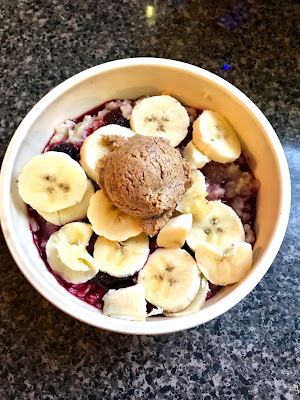 And finally, cause I know you're probably sick of seeing oats (but oh well), here's another Berry Oatmeal Bowl with cherries, blueberries, blackberries, and strawberries (cooked into the oats), topped with banana and chia-flax peanut butter. On Friday night, I drove to Jonesboro for my friend Nathan's birthday dinner at Tokyo House. It's an Asian fusion place that's best known for its buffet. But I've found that most buffets aren't so vegan-friendly. So I ordered off the menu while everyone else ate buffet plates. They didn't have many vegan options to choose from so I went with the House Tofu — a simple dish of fried tofu with veggies and brown sauce. It was okay. It was much better as leftovers when I add could some extra spices. While I was in Jonesboro, I stopped by my parents' house. They were out of town, but my dad left me some treats — homemade wine, his vegan chex mix, his homemade salsa, and some smoked tofu! He marinated all of the tofu and then used BBQ dry rub of half of it. 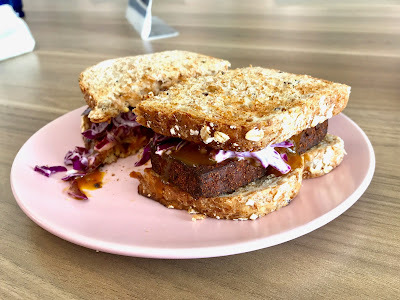 I had that BBQ tofu on a sandwich yesterday with red cabbage slaw and extra Trader Joe's Carolina Gold cue sauce. I used some of the non-BBQ smoked tofu to make a Savory Oat Bowl with nooch and dukkah. The smoked tofu has a very bacon-y flavor, so it was perfect here. Here's a random Sunday morning breakfast of Avocado Toast & Scrambled Vegan Egg. I made the Lemony Steamed Kale with Olives from the No Meat Athlete Cookbook last week to eat as a side dish. But I had some leftover that I used as the foundation for a Kale Salad with lots of veggies, beans, and seeds. Very good! And finally, we'll end with another Oatmeal Bowl (with berries, banana, and seeds). I love how this bowl has so much fruit that you can't even see the oats! I've recently started having oatmeal for breakfast a few days a week, subbed out for my usual weekday smoothie. I still think smoothies are my fave, but oatmeal is a nice change sometimes. I used to be so into having different complicated breakfasts every day, but these days, I'm enjoying just alternating smoothies and oats on busy week days. I typically have my oats with walnuts and berries since those are on the list of the seven foods you should eat every day. But some days, I'm craving something salty, like these Avocado Oats. It's a savory oat bowl with 2 Tbsp. nooch, a little garlic powder, and pink salt, topped with avocado slices and dukkah (an Egyptian sesame-flax seed spice that I found on clearance at Kroger!). Oh, and plenty of Yellowbird habanero sauce. 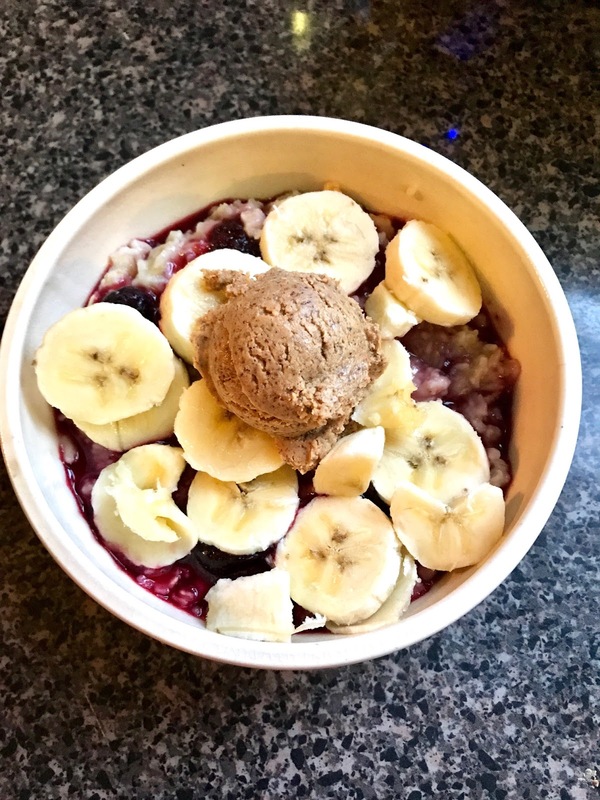 Here's a more standard Berry Almond Butter Oat Bowl with the most perfect little scoop of Justin's Vanilla Almond Butter (also scored on clearance!). I stirred a frozen berry medley into the oats as they cooked and sweetened with a little maple. Topped with banana and nut butter. And more oats! This time with blueberries, banana, and Trader Joe's peanut butter with chia & flax. The Saturday before last, Don of Lulu's Food was selling his homemade Aged Cashew Cheddar at the Cooper-Young Farmer's Market. SOOOOO good. I enjoyed plates like this one with crackers and olives (and always with a big salad and a glass of wine on the side) many nights that week. One night last week, I had a meeting in the building I work in, Crosstown Concourse, at 6 pm. That didn't leave much time for me to go home and fix dinner. So I stayed in the building and took a dinner break at the cafe at Crosstown Arts. Enjoyed a spicy, comforting bowl of Caribbean Pepper Pot Soup with Fresh Bread (the soup has sweet potato, peppers, and kale with a curry base). 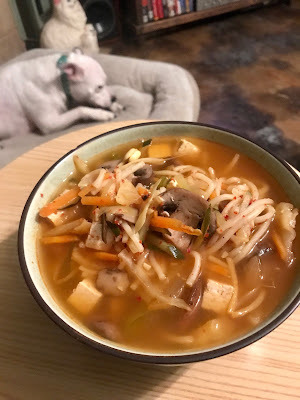 And finally, here's a lovely bowl of Tofu Veggie Ramen (made with Koyo baked mushroom ramen) enjoyed on Saturday morning while I watched The Leftovers (season 3) on Netflix. I haven't had a Saturday where I didn't have to run, go to yoga, or the farmers market in so long. So I took advantage of ramen time in my PJs (my favorite weekend tradition). It's been awhile since I've posted a random food round-up, so I'm reaching way back for a few of these meals — like back in early February when I visited my parents so my dad could help me do my taxes. My mom and dad cooked a big ole Southern supper that night! Vegan Chicken & Dumplins, Air-fried Okra, Fried Potatoes with Chow Chow, Slow-Cooked Collards, and Homemade Dinner Rolls. YUM! Paul and I ran the Stanky Creek 8K+ (about 5.5 miles) a few weeks ago, and afterward, we celebrated with burgers and beers from Huey's. I got the Beyond Burger again (love this new vegan option from Memphis' favorite burger joint! ), but I ordered it West Coast-style this time with vegan smoked gouda, avocado, and vegan mayo. Side of steamed veggies (but Paul shared his tots with me). A few weeks back, I picked up a Vegan Blackeyed Pea Sausage Biscuit from the Lulu's Memphis stall at the Cooper-Young Farmers Market. So good! I added jelly to it when I got home because sausage biscuits need jelly. Savory-sweet for the win. And I also picked up a Lulu's Vegan Goat Cheese & Chive Bun. Amazing. Made with Don's homemade cashew goat cheese. 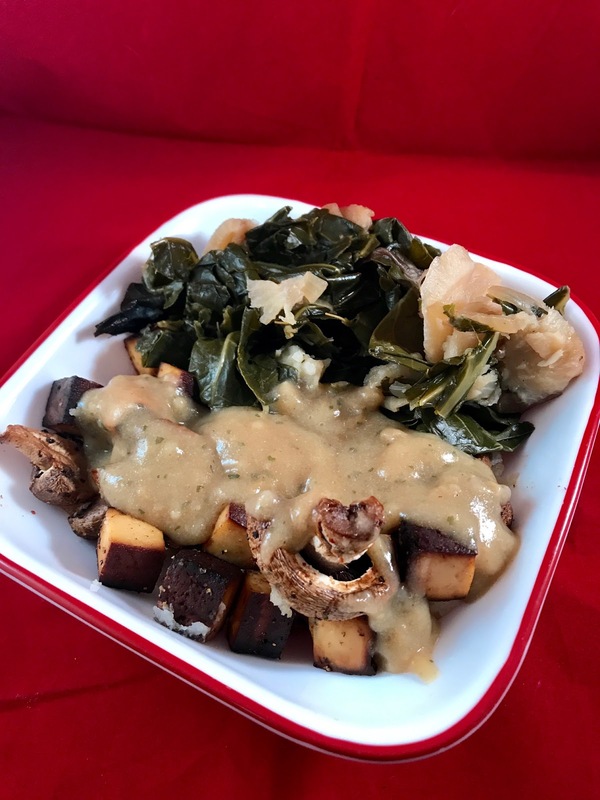 Here's a yummy week night bowl with Mashed Potatoes, Air-fried Smoke Tofu & Mushrooms, & Gravy, plus a side of Steamed Kale. And finally, here's a plate of random food from a cocktail night at my co-worker Caitlin's house. 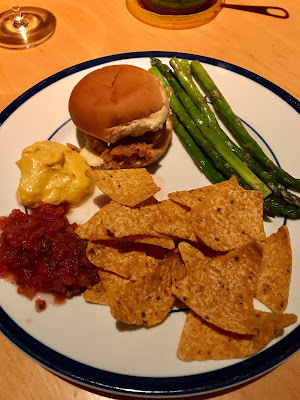 Her husband Steven made BBQ Jackfruit Sliders (so good!) and Roasted Asparagus. I brought Chips, Salsa, and Cashew Queso. There's a new cafe in the Binghampton neighborhood that prioritizes paying their employees a living wage and offering profit sharing for their core team members. Inspire Community Cafe serves simple, healthy breakfasts and lunches — think smoothies, quinoa bowls, salads, and (non-vegan) quesadillas. They have a few vegan options. I went there for lunch yesterday with my friend Susan and ordered the Southwest Black Bean Veggie Bowl. You can pick between quinoa and rice as a base. 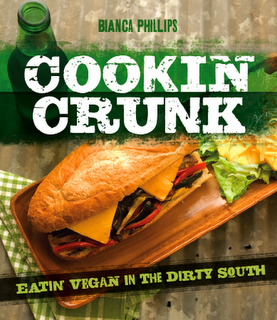 The grain is tossed with well-seasoned black beans, roasted sweet corn, and fresh baby spinach. Of course I opted for the quinoa option! The quinoa was REALLY well-flavored. I'm not sure what they used, but it was probably the best quinoa I've been served in a restaurant. 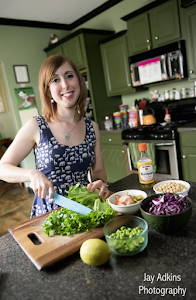 As much as I love having decadent vegan options in restaurants, I do really like how I feel after I eat something super-healthy and whole foods-based like Inspire's quinoa bowl. There's also a black bean & sweet potato bowl, and any salad can be made vegan. Plus, there's a veggie chili that can be served over quinoa or rice. Inspire also sells locally made vegan cookies by Araba's Sweet Spot. I probably should have bought one, but I was really trying to avoid sugar yesterday! The space is super-cute with hand-crafted tables and artwork created by Binghampton neighborhood kids from the Carpenter Art Garden. Inspire Community Cafe is located at 510 Tillman Street. I'm not sure how I got on the Ben & Jerry's marketing list, but I'm sure glad I did! For the past couple years, around this time, they ship me the new vegan flavors to try and review. Last week, the latest vegan flavor — Chocolate Chip Cookie Dough (!!!!!) arrived at my office in a cooler of dry ice. Yes, my co-workers were envious. For the record, I did try to share. But the dry ice makes the ice cream too hard to scoop, so I wasn't able to dig in until I got home and transferred it to my freezer. Oh well. More for me! I've long said that Ben & Jerry's makes the best vegan ice creams. And that's still the case. Especially with this one! You know how most cookie dough ice creams are mostly vanilla with a few little cookie dough gobs here and there? Not the case here at all. This creamy almond milk-based ice cream is LOADED with chewy cookie dough bits. As I was spooning a serving out, it was impossible to get a spoonful that didn't have 4-5 dough bits. That means that every bite provides that creamy, chewy satisfaction. PB & Cookies is still my number-one, but I think this may be a close number two! 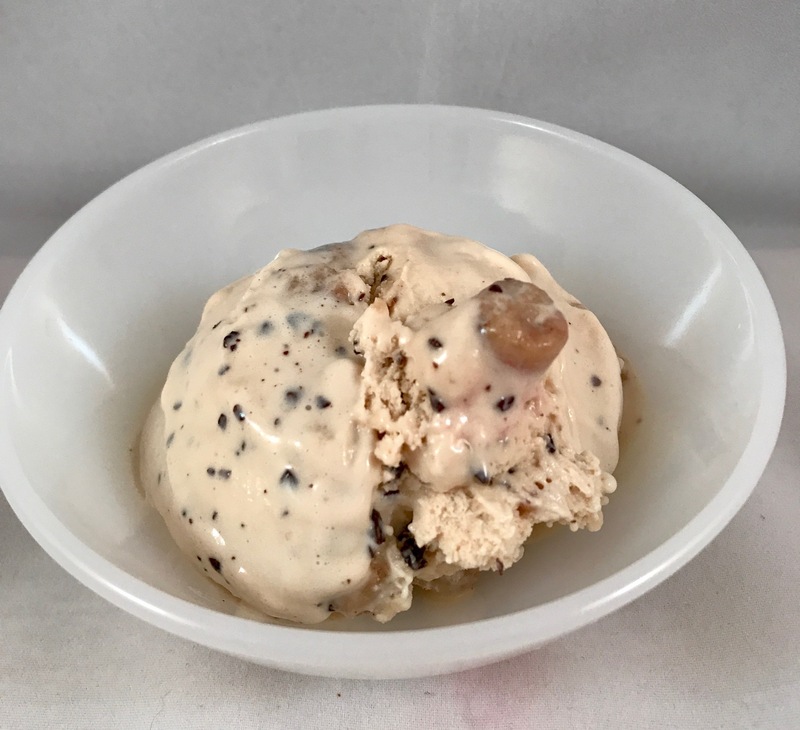 Plus, there's another new B&J's vegan flavor, Chocolate Caramel Cluster (chocolate with peanuts, fudge chunks, and salted caramel swirl). So I'll have to find that one soon! Thanks Ben & Jerry's for making the world a better place. Paul and I had plans to celebrate Valentine's Day on Saturday with a date night dinner at Kayne Prime. It's a fancy steakhouse in Nashville with vegan options, and he had a huge gift card that he'd won in a work contest. Wouldn't have been our first choice, but free food and drinks! But I arrived in Nashville on Saturday afternoon, about four hours before our dinner plans. And I was hangry. So I made a pit stop at The Southern V. I was planning to order their Fried Chick'n Salad since I figured that'd be a lighter option before dinner. I mean, it's still topped with fried seitan, but you know, greens make it light, right? This was perfect with their vegan ranch! And I added a little hot sauce to the chicken to make it Nashville hot chicken. They do sell a Nashville hot version of this salad, but I prefer to add hot sauce to taste. The salad was all I was planning to order. But when I got to the counter, I saw Glazed Vegan Doughnuts. And, well, I just HAD to. Y'all, this was the best doughnut I've EVER had — better than Voodoo, better than Revolutions, better than Five Daughters. The Southern V only makes them on Saturdays, so if you're ever planning a trip, go there on Saturday! Our reservations at Kayne Prime were for 7:45 pm, but it was closer to 8:30 before they were able to seat us. Good thing I ate all that fried food! I started with my new cocktail of choice, an Old Fashioned. Last time Paul and I ate here, we started with the Truffle Fries & Sambal Ketchup, and they were our favorite part of the meal! These are drowned in truffle oil. So good. Of course we had to get some again. Last time I was there, the daily Green Plate (the veg option) was the most delicious cauliflower steak! But this time, they were offering a less exciting Pasta Primavera with roasted veggies and mushrooms. It was good, and I loved the rolled pasta. But this was a little oily for me. The cauliflower steak was definitely my fave of the two. Unfortunately, Paul wasn't happy with his meal at all. So it was kind of a bust. But we went out for beers afterward and made the best of it. The next morning, we'd planned to go on an 11-mile run together — the last long run in our training cycle before the Little Rock Half-Marathon. But Paul has been having calf issues and decided to sit it out. So I headed out on the Hendersonville (that's the suburb where he works) Greenway on my own. Had a lovely run and saw lots of native birds and even some seagulls (yes, we have those in Tennessee in the winter!). After my run, I was famished, and we headed to Graze, our usual vegan brunch spot. There was an hour wait for a table, so we had a couple beers at the Mexican joint across the street while we waited. I ordered the Tofu Rancheros — corn tortillas topped with tofu scramble, black beans, salsa, guac, and cashew cream. So good! And a nice healthy, whole foods-y change after a day of fried food and oily pasta. Worth the wait! 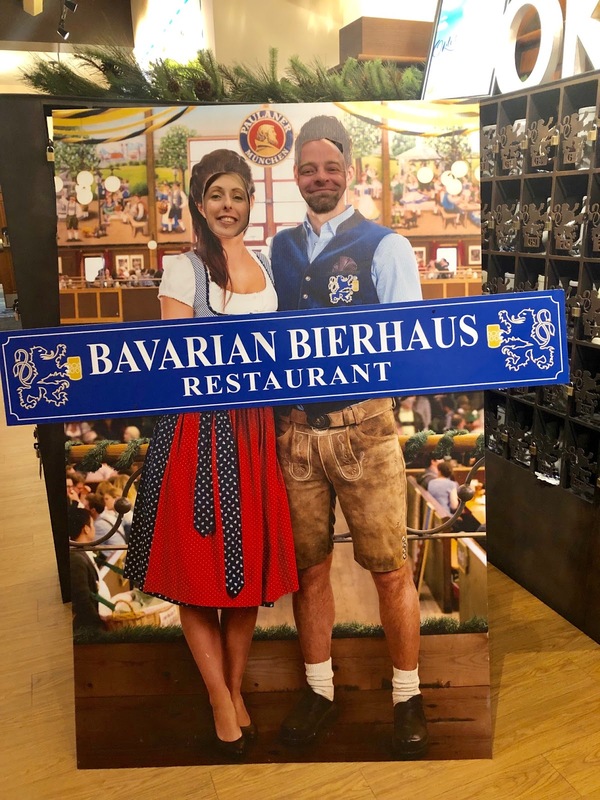 Paul's family made plans for us to all go out to Bavarian Bierhaus, a German restaurant in the Opry Mills Mall, for dinner. When I heard about this, I was a little concerned. What on earth could I eat there? Besides pretzels and beer? But lo and behold, they had a VEGAN MENU! Of course, I still started with an appetizer of a Giant Pretzel. From the vegan menu, I chose the Tempeh with Veggies. This was a sauteed tempeh with asparagus, red pepper, and spinach. Very good! Probably not really German, but that's okay. I'm so glad they had options! It was such a fun experience! My mom's side of the family came over from Germany several generations ago, so it was cool to get a little taste of my family's culture. They even had a small shop selling German treats, and I got some curry ketchup to take home. Love that stuff! One more thing — on the way to Nashville (and on the way back), I stopped at the Pilot gas station in Hurricane Mills, Tennessee (a tiny town that's also home to Loretta Lynn's mansion). And look what I found! VEGAN CREAMER!! I didn't even know this was a thing!!!! My partner Paul spends his weeks in Nashville, where he works, so when Valentine's Day falls on a week day, I'm on my own. And I am totally fine with that. We're celebrating together this weekend, so we'll still have our V-Day fun. But I spent today in self-care mode. This morning, I woke up and headed out for a 3-mile run on a lovely 50-degree morning (that's cold to me typically, but it's great running weather). Then I had this Strawberry Dark Chocolate Chip Smoothie. It has banana, strawberries, and walnuts. And then I threw in a few squares of bourbon-aged dark chocolate (that my dad got me for Valentine's Day) and pulsed in the Vitamix until it formed little chips. I usually eat at work, but since I'm taking a self-care day, I decided to walk home (I live VERY close to work) and take the full lunch hour. I had a Giant Salad with Heart-Shaped Beets! I cut my pre-cooked Love Beets into little hearts. The salad also has carrot, red cabbage, cucumber, bell pepper, craisins, almonds, pumpkin, and sesame seeds, plus a low-oil balsamic-dijon dressing that I threw together. Our plant-based cafe at work (I work at Crosstown Arts) had Vegan Chocolate Strawberry Cupcakes today! A perfect afternoon treat with a cup of Earl Grey tea while I wrapped up a few tasks at work. This was a very large cupcake, and I ate the whole thing. After work, I stopped by Hollywood Feed for Valentine's for the pets! I got the cats some special canned food by B.F.F. that was called Valentines Dinner in Gravy! WHAT?! They loved it. Maynard got a Carob Cake with Carob Frosting. For dinner, I made myself a nice pasta meal using a recipe I found in the No Meat Athlete Valentine's-themed member newsletter — Easy Avocado Pesto Pasta with Sundried Tomatoes with a side of Garlic Bread. Plus, a nice glass of homemade wine made by my dad. The pasta (I used Explore Cuisine mung bean & edamame fettucine) is coated in an avocado-walnut-basil pesto and tossed with sundried tomatoes. Very good! And oil-free! 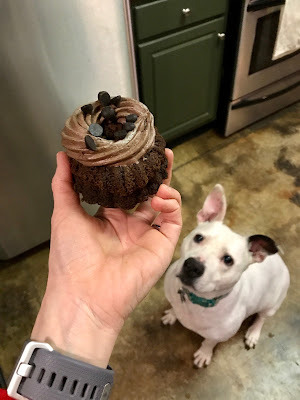 What a perfect day of meals – a lot of healthy stuff and a super-amazing cupcake treat. After dinner, I had a little self-care night at home with yoga for the heart chakra, a bath with a giant unicorn bath bomb (a gift from my mom) that I've been saving for a special occasion, a facial steam and mask, and some reading time with NPR host Peter Sagal's new book, The Incomplete Guide to Running. Hope y'all had great Valentine's Day too! I'll check back in after my date night with Paul. Today's random meal round-up is brought to you by bowls — those amazing vessels that can instantly turn any meal into comfort food! Bowls made from dinnerware material are great and all, but you know what's better? Bowls you can eat. Like this Bread Bowl with Potato Corn Chowder from Imagine Vegan Cafe. Our friend Don (of Lulu's Baked) created some bread bowls for Imagine to use for last week's soup special. Imagine owner Kristie texted me that morning to let me know I should not miss the bread bowl special, so I made sure to dine there after yoga class. The bread was amazing. The soup was delicious on a cold, rainy night. Yes, I ate the whole thing. Don't let anyone tell you that carbs are bad for you. Carbs are fuel. Sure, white bread isn't the most nutritious bread, but it's okay sometimes. As I've mentioned here before, my favorite go-to meal when I'm in a hurry and have nothing prepared is a Bean/Grain/Green Bowl like this one — white beans, brown rice, steamed kale and broccoli, kraut, garlic tahini sauce. I've been switching a few of my weekday breakfast smoothies out for oatmeal bowls lately. Like this one with almond butter, blueberry, banana, and flax. And this one with strawberry, banana, blueberry, walnuts, and flax. I've learned that Overnight Oats work best on mornings when I have gym classes and get home later than I do when I run. It's hard to eat a bowl of hot oats quickly, but you can scarf down cold oats. I've been making mine the night before with chia seed, maple, and almond milk. And then I top with fresh fruit, nuts, and seeds in the morning. Hey look, it's a jar! Not a bowl! Here's something else not in a bowl — a pre-race (before the Crosstown 10K) slice of Sprouted Grain Toast with Peanut Butter, Blueberries, and Banana. I'll start with this delicious bowl of Vegetable Lemongrass Ramen at Atomic Tiki, a tiki bar in my neighborhood. They used to have more vegan options on the menu, but they've changed the menu again. There are only a couple of vegan items left, including this delicious bowl (which you have to order sans egg to be vegan). But I've been told by the owner, who is awesome, that they can pretty much make anything vegan by subbing out tofu for meat. Sweet score at Target! Sweet Earth Cauliflower Mac! This frozen meal combines vegan cheese sauce with pasta and cauliflower. It's really good. Made a great desk lunch with a side salad. 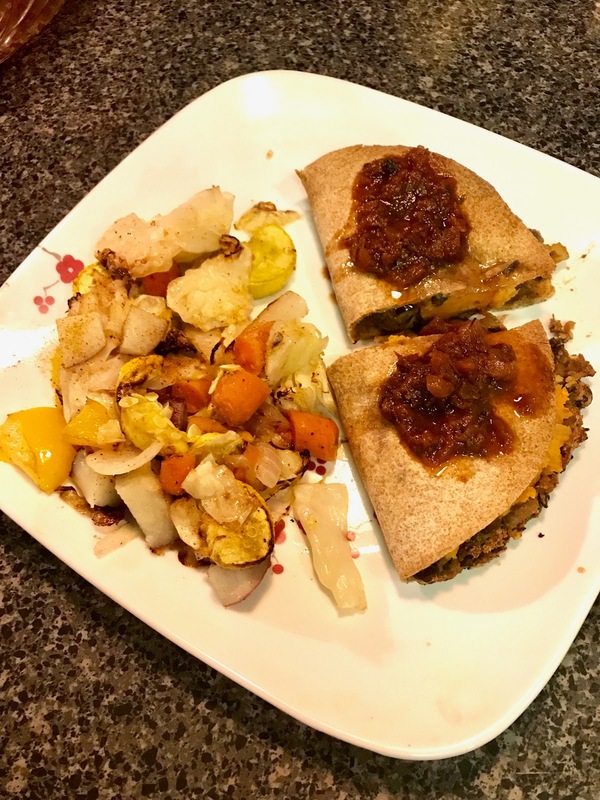 Terribly lit photo of a really tasty Black Bean & Sweet Potato Quesadilla on a sprouted grain wrap, topped with salsa, served with a side of roasted veggies (cabbage, onion, carrot, potato, squash). Rushed photo (because I was hangry) of a Smoked Tofu Veggie Wrap with Air-fried Kale Chips. My dad got a smoker, and now he's keeping me stocked in smoked tofu. YES! I had some of that smoked tofu here in a whole wheat wrap with cucumber, carrot, green olive, lettuce, and hummus. 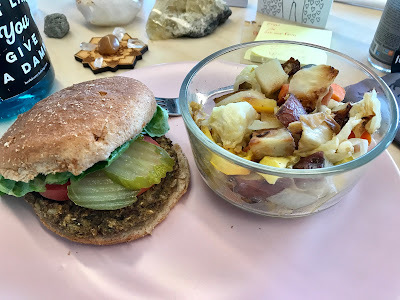 Another desk lunch! I made these Red Bean & Brown Rice Burgers (using the No Meat Athlete veggie burger formula) a couple weeks ago and froze the leftovers. Had one last week with leftover roasted veggies. And finally — here's a plate that satisfied all my weird cravings for spicy, salty, and fried. I made my dad's Air-fried Buffalo Cauliflower (the best!) with cashew ranch and served with Air-fried French Fries (the Alexia kind from a bag) with BBQ sauce and Steamed Kale.